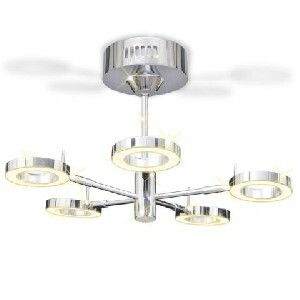 Description: This unique ceiling lamp, with 5 rotatable LED bulbs, has a simple and modern design. It’s a great item to illuminate the interior of your home, office, meeting room, etc. This lamp can be easily mounted on any ceiling thanks to its high-quality metal base. This exclusive ceiling lamp will make a great addition to your living space! This ceiling lamp emits a pleasant warm white light colour, which is conducive to a relaxing and pleasurable ambience. Thanks to the low power consumption, the light is energy-saving and thus eco-friendly. This unique ceiling lamp, with 5 rotatable LED bulbs, has a simple and modern design. It’s a great item to illuminate the interior of your home, office, meeting room, etc. This ceiling lamp shines in warm white, which will create a relaxing and cozy ambiance. Thanks to the low power consumption, the light is energy-saving and thus eco-friendly.